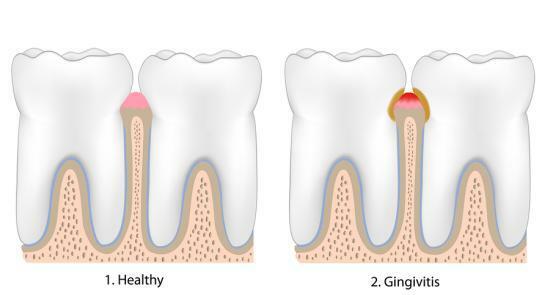 Gingivitis is basically a form of a disease in which there is inflammation of the gums. Healthy gums are usually pale, unlike when one is suffering from this disease, where the gums become red and swell. The main cause of this is believed to be the accumulation of plaque on the gums, which is a result of bad oral care. Your teeth rely on your gums and so, it is important that one must take good care of their gums. Brushing with too must force or vigor can also cause problems. There are a number of Do’s and Don’ts that can really help you if you follow them. Try to use toothpaste containing salt or tea tree oil. Eat healthy and preferably raw vegetables, rich in nutrients. Try flossing at least once a day. Don’t consume fatty foods and choose fiber rich foods. The most old advice, brush twice every day and change your toothbrush every 2 months. Go for simple sugars, not refined. Do not smoke, it aggravates the bleeding of gums. Try reducing the use of toothpicks, as they can directly cause bleeding. Lemon Juice at 50% concentration can help improve gum health. Tea tree oil is found to be very effective when applied directly to affected area. A massage with coconut oil on the gums can be relieving. Apples are effective in healing gums and so, having them at regular intervals is a good remedy. Orange juice with or without sugar and a little cumin can help reduce the bleeding of gums. These are simple remedies that can help prevent of solving Gingivitis. If the situation gets worse, it is always recommended to visit a doctor. So, take care of your teeth, brush daily, and you’ll be just fine.